Why download Any Video Converter? Try Movavi VC instead! Thinking of downloading Any Video Converter? Different media formats can often be incompatible with different mobile devices. 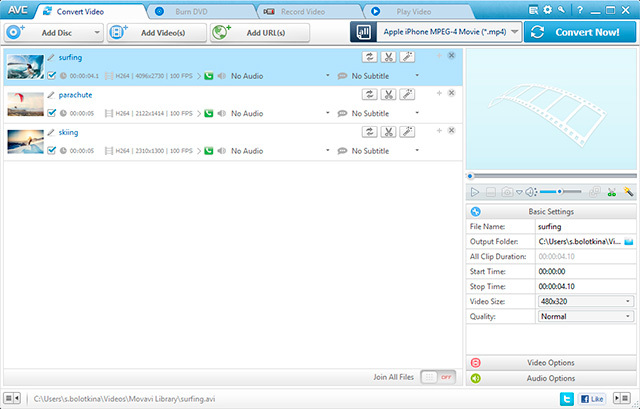 All you need to solve this problem is to find a special encoder – like Any Video Converter, developed by Anvsoft. This app is popular because it is easy to use and lets you save videos from YouTube. But before you download Any Video Converter, why not take a look at a more effective alternative? Let’s compare* AVC with its equivalent from Movavi, Movavi Video Converter, and decide for yourself which program is more suitable for your tasks. The interfaces of both applications are uncluttered and simple. 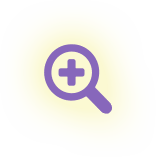 However, the small font in Any Video Converter may put a strain on the user’s eyes, while the font used in Movavi Video Converter is larger and easier to read. Also, the presets for mobile devices in AVC are hidden in a drop-down list, while Movavi places the preset icons in the bottom part of the program window, making it simple to start converting files immediately. The conversion features of both apps are shown in the table below. Both converters can handle HD and regular movies and sound files in virtually all format types: MP4, AVI, MKV, 3GP – the list goes on. Both have convenient presets for popular mobile devices, from iOS- and Android-based devices to Sony PlayStation and Xbox. 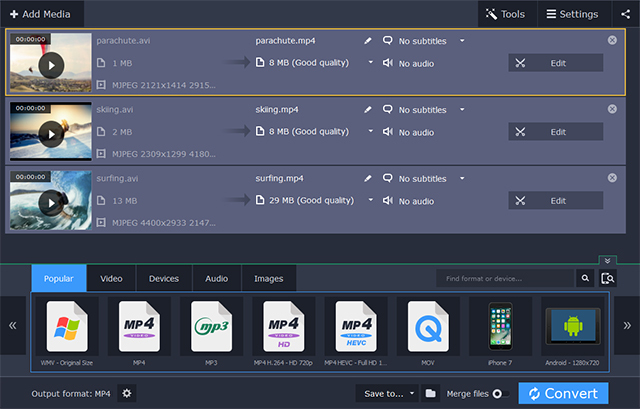 Additionally, both programs offer batch conversion and video-to-GIF processing, but only Movavi Video Converter lets users make videos from still images. Another strong point of the Movavi app is the ability to automatically see the appropriate settings anytime you plug a device into your computer. 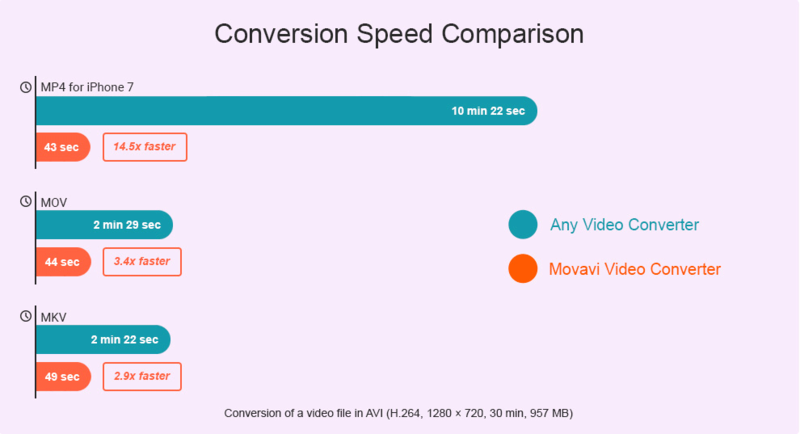 But the key advantage of Movavi Video Converter is simply that it’s faster. The high conversion speed is thanks to the support for NVIDIA® CUDA™, NVENC, NVDEC, Intel® HD Graphics, and AMD® acceleration technologies as well as Movavi’s SuperSpeed mode, in which a video stream is transformed into another format in a safe fashion and without quality loss. The programs’ main video-editing capabilities also have some important differences. In both programs, you can go beyond just converting a video file to also flip, crop, and rotate footage and adjust image color. Cutting and joining clips into single elements in either program will help you retain only the sections you want. But, unlike Any Video Converter, the Movavi software lets you cut out multiple fragments with a high degree of precision – down to a single frame. AVC does provide its users with the ability to burn the resulting videos on DVDs, but this feature isn’t really needed in a video converter. On the other hand, video stabilization is very important when dealing with, say, shaky footage shot on a phone – and this option is only available in the Movavi app. User support is especially relevant for those who are no video-processing pros. The official websites for both companies provide a number of detailed tutorials, video guides, and FAQs. But only Movavi offers an online chat – a very useful tool for anyone who’s new to video conversion and in need of immediate technical advice. As we see, the Movavi program is significantly cheaper than Any Video Converter, an additional advantage over its competitor. If this is what you need from a video converter, the Movavi app will suit you perfectly. System requirements: Windows XP/Vista/7/8/10 (32 bit or 64 bit); Mac OS Х 10.7 or higher (64 bit). 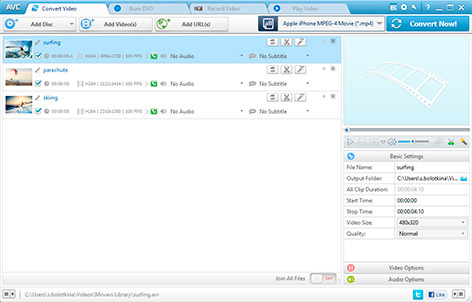 To learn more about Movavi Video Converter, visit the Windows or Mac product pages. *For this review, we used the latest editions of AVC and MVC with all the appropriate updates.